Back in October I wrote about observations of superluminous supernovae. These supernovae are more than ten times brighter than type Ia supernovae. So powerful that it was postulated that they could be caused by a pair-instability interaction, where the gamma rays produced by the explosion have so much energy that they produce pairs of electrons and positrons. But another paper published later that month proposed a different mechanism. In this model, the extreme brightness is caused by a magnetic heating effect. When a supernova explodes, the core typically collapses into a neutron star. The magnetic fields of a neutron star can be quite strong, and in their most extreme case the neutron star is often referred to as a magnetar. The intense magnetic field of a magnetar can interact with surrounding material, causing it to superheat. This is similar to a magneto, where a rotating magnet can produce pulses of electric current. Now new observations have been published in the Astrophysical Journal (paywalled, but arxived here). In this paper, the authors looked at data from two new superluminous supernovae known as SNLS 06D4eu and SNLS 07D2bv. You can see an image of SNLS 06D4eu, indicated by the arrow in the figure above. It might not seem like much compared to the bright foreground stars in our galaxy, but keep in mind that this supernova is about 10 billion light years away. So far away that its “distance” depends on what you mean by distance. It is perhaps the most luminous supernova ever observed. What the authors found was that these supernova best matched the magnetar model. They brightened quickly (a pair-instability supernova would brighten slowly) and their gradual fading best matches the model of a rapidly spinning, highly magnetized neutron star that heats the ejected material of the supernova at the cost of slowing down. So it seems that the magnetar model is the most likely mechanism for these types of supernovae. Of course there are questions that still remain. These particular superluminous supernovae are noted for their lack of hydrogen. It’s not entirely clear what causes them to eject their hydrogen before later becoming a supernova. To answer that question we’ll need more data. Paper: Howell DA, Kasen D, Lidman C, et al. 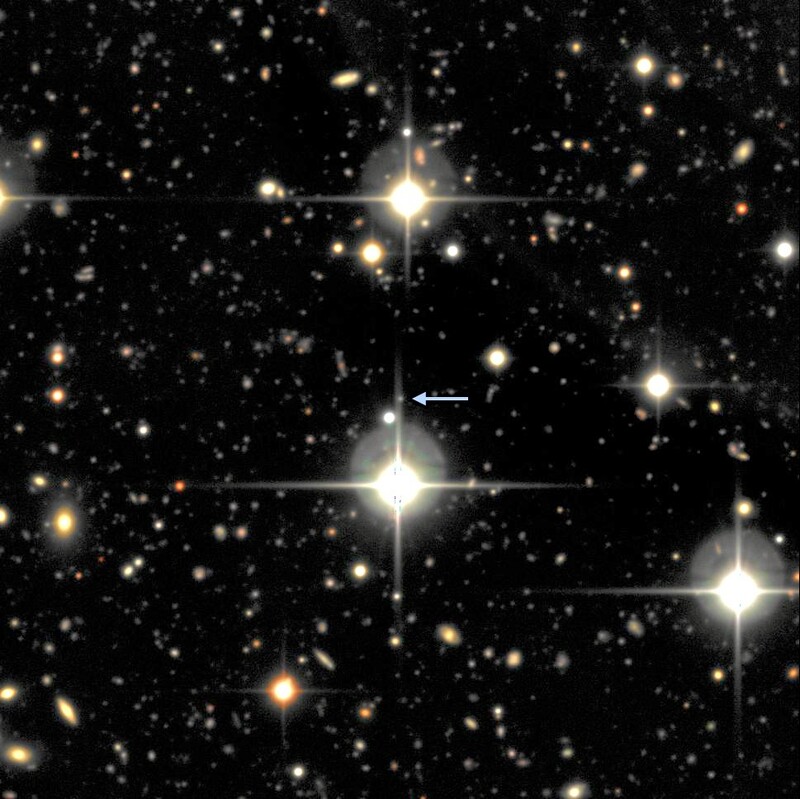 TWO SUPERLUMINOUS SUPERNOVAE FROM THE EARLY UNIVERSE DISCOVERED BY THE SUPERNOVA LEGACY SURVEY. ApJ. 2013;779(2):98-.